It starts out with the demand to reframe not only the economy and its production modes, but also ourselves, our communities, and our world, in order to achieve a new understanding of the different spheres of economic life: work, business, market, property, and finance. – What do we really need? How is surplus distributed? – How do we relate to each other whilst seeking for survival? – What do we consume? – How do we care for our commons? So far, we have ignored most of these concerns and eroded not only our connatural world, but also our human relationships and societies, where massive wealth for a small fraction of the world’s population stands opposed to the exploitation of many others. The authors encourage the reader to think in a range of scales, moving from the bigger picture of planet Earth as “our life-support system”, “one big garden”, “our commons – what we and all other living species share (and should maintain and safeguard)”3 to cities and communities, which can, according to the authors, be also seen as gardens. This metaphor is used throughout the book to depict a sustainable and caring economy, where surplus and knowledge are generated and grown through its gardeners. “The community garden offers a simple vision of interdependence among the gardeners, other people, and the natural world”4, giving possible answers to the concerns mentioned above. Also, it offers a simple comparison with the current state of our ‘planetary “garden”’, where it has become obvious that it can no longer support economic systems that ignore its needs for care and restoration. – Investing our wealth in future generations so that they can live well. Zooming even further in with our thinking, from cities to individuals, the authors observe that most people don’t recognise their role as significant actors and shapers in the economy. Nevertheless we all know that we can help grow the economy through increased consumption – as it is often told by governments – and also, we can have an effect by consuming less or differently. But the authors stress that they want to introduce more strategies than merely ‘consuming our way out’ – we work, we care for one another, we participate in organisations, some might have their own business and employ people. The economy is being framed as a ‘diverse social space’ of interaction at different scales: at home, locally, and globally. As soon as we start seeing ourselves as “economic actors with multiple roles”7, we can begin to redesign, shape, and ‘take back’ our economies little by little. The act of reframing plays a crucial part in the move towards a more sustainable and just economy. So far, we’ve understood the economy as “an engine that must be fueled by growth” and ourselves as “individual cogs – economic actors only if we work to consume”9. To overcome these understandings is what the authors call ‘reframing’: to imagine the economy and its actors differently. It means to also consider all the things and actions that make our households, communities, and nations work, which are not only the material outputs, but also the immaterial labour so necessary for our environments and social well-being. 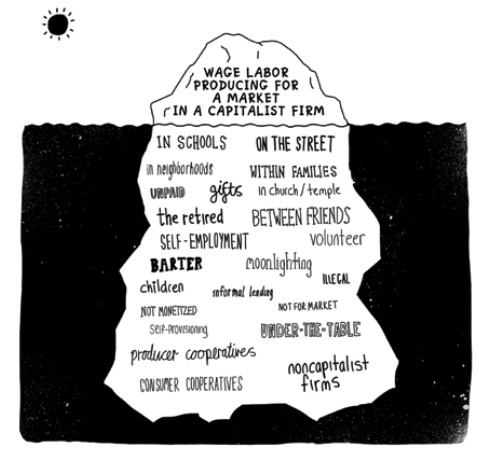 To imagine the economy as an iceberg is the first step to visualise those economic activities that are usually not considered in mainstream economies: taking care of children, giving gifts, volunteering, between friends, bartering, informal lending, etc. The five different aspects of the economy (work, business, market, property, and finance) are drawn from this image to establish a more systematic view on the diverse economic practices. To each of these practices, the authors dedicate one chapter as follows. 1. A 24-h-clock on which the total hours of different kinds of activity are recorded. 2. A well-being scorecard on which the five types of well-being are rated on a scale from 1 (poor) to 2 (sufficient) to 3 (excellent). In this chapter, the authors attempt to define business beyond its mainstream conception of profit-making ‘fonts of economic growth’. The capitalist firm as a way to achieve the most efficient production and organization of wealth is widely respected, where profits are privately accumulated by the business owner or shareholders, as an incentive to take risks and compete with others. The authors identify a major flaw in this conception: the depletion of our resources and environments. Furthermore, the wealth created by capitalist business is not distributed equally at all: in 2000, 1% of the world’s population owned 40% of global wealth, while 50% of the world’s population barely owned 1%14, giving rise to the Occupy Wall Street movements infamous slogan: “We are the 99%”. How wealth is held or shared and distributed seems to have a great influence on the problems we are currently facing, so taking back business by shifting decision-making power, by negotiating between producers and non-producers, by re-distributing surplus to social and environmental ends, and by being transparent about numbers and wages, can contribute positively to the well-being of people and the planet. Financial institutions are usually a way to manage and increase monetary wealth. How our wealth is managed, distributed, and spent can be devastating for humans and nature, particularly if only a small fraction of the world’s population gains from it. The authors invite the reader to look at investment from a different point of view: investing in our future to ensure the survival of following generations, not as an end in itself. Combining monetary investment with all the other kinds of non-monetary investments such as time, energy, and imagination, can help build more secure futures with social and individual benefits. Again, the authors look at the economy as a community garden, and what investing in the maintenance of the nutrients taken out of the soil and in the relationships between the people who take care of the garden means and produces in terms of returns. In a community economy, the authors write, pooling wealth as investment funds become a ‘huge potentiating force’ when they can be used towards creating social returns that can be shared in transparent and ethical ways. To make sure that investments made are actually building better futures, it is necessary to regularly draw a balance on what impacts they have. In the global financial system, it seems impossible to retrace what invested money has produced, and the demand for more transparency and more ethical investment possibilities has increased in the past years. A new tool has been developed to calculate the social return on investment (SROI)24, which has been widely discussed as reducing all benefit to monetary values – so, the authors propose a version of the ROI, the Community Economy Return on Investment (CEROI), where investments and returns are not necessarily measured in monetary terms, expanding our idea of finance towards social and environmental ends. *All of the tools mentioned in this text can be found right here on the website of this book. 11 Rath, T. & Harder, J. (2010): Wellbeing: The Five Essential Elements. New York: Gallup Press. 12 Coote, A., Franklin, J., and Simms, A. (2010): 21 Hours: Why a Shorter Working Week Can Help Us All to Flourish in the 21st Century. London: New Economics Foundation. 13 Gibson-Graham, J.K., Cameron, J., Healy, S. (2013): Take Back The Economy – An Ethical Guide for Transforming Our Communities. Minneapolis: University of Minnesota Press, pp. 39-48. 14 Davies, J.B., Sandstrom, S., Shorrocks, A., Wolff, E.N. (2007): The World Distribution of Household Wealth. Helsinki: World Institute for Development Economics Research. 15 Gibson-Graham, J.K., Cameron, J., Healy, S. (2013): Take Back The Economy – An Ethical Guide for Transforming Our Communities. Minneapolis: University of Minnesota Press, pp. 89-94. 20 See, for example, the work being done around the world towards a European Commons Assembly: https://europeancommonsassembly.eu. 21 Gibson-Graham, J.K., Cameron, J., Healy, S. (2013): Take Back The Economy – An Ethical Guide for Transforming Our Communities. Minneapolis: University of Minnesota Press, p. 130. 22 An example made by Silke Helfrich during the conference UTOPIKON in Berlin, Nov. 2016, visited by the author of this review. 23 Gibson-Graham, J.K., Cameron, J., Healy, S. (2013): Take Back The Economy – An Ethical Guide for Transforming Our Communities. Minneapolis: University of Minnesota Press, p. 131. 24 Measuring Social Impact: The Foundation of Social Return on Investment (SROI) (2004). London: New Economic Foundation. 25 Gibson-Graham, J.K., Cameron, J., Healy, S. (2013): Take Back The Economy – An Ethical Guide for Transforming Our Communities. Minneapolis: University of Minnesota Press, p. 197.